I made this yesterday and it was AMAZING!!!! How long would you bake this from a frozen state. Also how long will it stay good in the freezer? Hi! I chose this as the first recipe from your site to make. I just finished making/eating it and it was a big hit in the house! I look forward to trying more of your recipes; thanks so much for making this site! I am really thankful to you.which you give me the awesome information. Is one cup 8 ounces??? 1 cup for dinner is sooooooo small I think I would starve! 8 ounces measured out on the other hand is quite a bit! Help! Sorry, I am somewhat inexperienced with pasta…how many cups of dry macaroni is 12 oz? Looks delicious! I have not eaten Mac-n-Cheese in years. I was looking for a meatless meal, but….. Wasn't sure I would like the addition of the Broccoli….OMG! OMG! OMG! This is so yummy!!!!! how would you adjust bake time for individual 10z dishes? I added fresh garlic and good Dijon mustard to give it a kick up! I made this last night. Used panko for the breadcrumbs and seasoned them w/basil, oregano, and thyme. That added crunch really makes it. I appreciate all the real ingredients you use. Thanks for all that you do! After reading your comment about panko I decided to use it too. It was great!! Just made this tonight, SO tasty!! I made it with quinoa pasta and it rocked. Thanks for all the great recipes!! Made this a few nights ago exactly like the recipe and making it again tonight without the toppings and I added spinach to it. Sooo yummy! Oh my goodness. I just made this and it is AMAZING. Thank you so much! Another delicious creation & so easy to make! 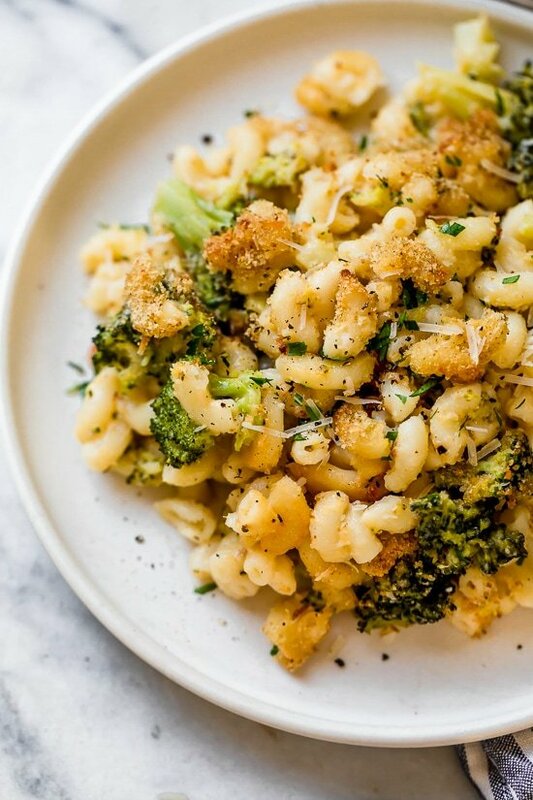 You can never go wrong with mac n' cheese, especially if you can enjoy a lighter version! Just made this with Wild Mushrooms added and Spinach instead of broc! It's amazing and yummy! 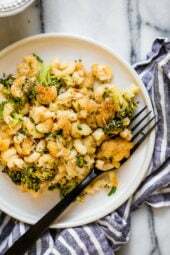 I wouldn't think macaroni and cheese could sound any more delicious than it already does, but the addition of broccoli (my family's fave green veggie) tops it! Gina: I love all of your recipes, they are the best WW recipes I have tried. I made your apple scones this weekend and have your mac and cheese in the oven. I'm planning to make your carmelized onion and red pepper fritatta this week and the quinoa salad. Your recipes are helping me stay on track with WW and eat yummy things. P.S. I used unsweetened almond milk instead of regular milk in this recipe and it brought the points plus value down to 7. I just made this an hour ago and used frozen broccoli. Turned out great. I was wondering…12 ounces of uncooked pasta is equal to how many cups of uncooked pasta? Thank you for this recipe! I've always thought about making macaroni with white sauce, but didn't know what to start! I adjusted it a bit, according to what I had in my pantry, and it turned out great! Thank you for the inspiration! I had purchased everything I needed a while ago for this dish, except the broccoli, and just made it last night. Once again, another keeper. The only thing I might do differently is maybe make the portions a little smaller so I can have some type of meat with this, maybe a petite mini Turkey Meatloaf?? Thanks Gina!! Looks fantastic! 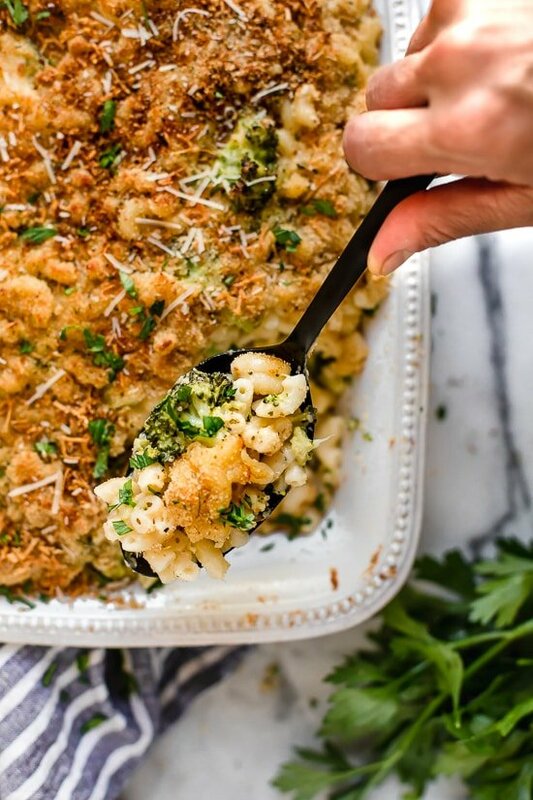 My husband has been asking for baked mac & cheese and I think I have found the one to make! Great photos, too. Hi Gina, I love your recipes! I decided about a year ago (after college) that I need to start actually cooking. I quickly found your blog and it got me from jarred marinara spaghetti to making real meals every night! I just have one question, which may seem silly but I am new to cooking, how big are your serving sizes? I am trying to track my food intake, and I have been assuming it's a cup.. is that right? This looks so scrumptious, Gina! 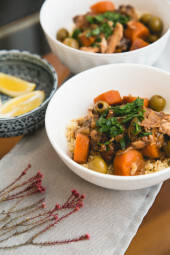 Lovely recipe for weeknights! Oh YUM!!! Who doesn't love mac 'n cheese??!!?? And incorporating the broccoli just makes it even better!! 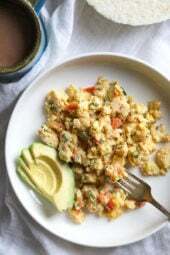 I also like the idea that this recipe could easily be made for a meatless Monday!! Oh yum! This looks delish & so comforting! I'd love to give it a try. Made this last night and it turned out really tasty. I haven't always had the best luck with the reduced fat cheese, but shredding into the hot white sauce melted it nicely. I added a little dry mustard to bring out the cheese flavor a little more. I will definitely make it again. Can you use almond milk in place of skim milk? Hmmmm, comfort food! And you have the broccoli for a healthy kick. Sold! 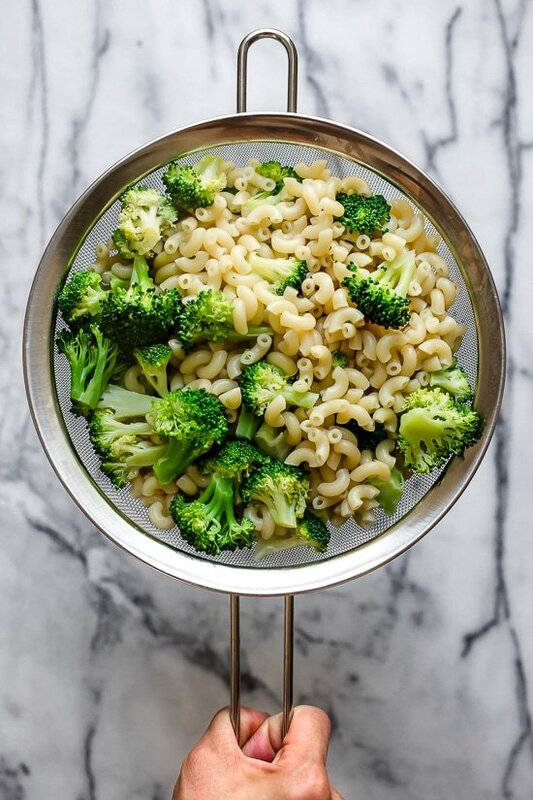 I love broccoli, and I love Macaroni. This is a 'win, win' meal! Gina: I just recently came across your site and just love your recipes. My husband was recently diagnosed with high cholesterol so I have been cooking low fat meals and have followed many of your recipes. Is there any way you could include the cholesterol count in your calorie counts? What about chopping cauliflower real small, you won't notice it because of the color, where the broccoli is easier to detect. Made it this week! Very good! I actually added chicken and 2 left over pieces of cooked bacon that I had leftover in the fridge. I love that it is an easy recipe to make your own or leave as is. I don't eat much meat anymore, but even I thought that some chicken would be a nice addition! For a bit of a flavour kick, add some dry mustard and garlic powder to the flour and add a little Worcestershire sauce to the milk/broth. Yum! i'm not a huge cheese fan…any suggestions on what to use for a very mild cheese? or just cut down the amount of cheese i use? What would be the best way to freeze this? Just got back from a freezing day skiing….had left this ready in the fridge, ready to be popped in the oven…can't wait to tuck in !!! Any chance I could prepare this ahead of time, then cook it in the oven a few hours later? Or would the noodles get mushy? What a BEAUTIFUL recipe! I'm just eating it for dinner now and oh my godddd so tasty 😀 for the breadcrumbs, I used three seeded brown bread and added into the food processor with it a little bit of oregano, rosemary and some chives. PERFECT. Absolutely delicious. Really Good, I would certainly do it again! Do you think I could swap rice instead of pasta and get the same results? Kinda like a Broccoli Au Gratin thing? Great recipe! I'm vegetarian and used veg broth and turned out perfect. Thank you for sharing! I never cook, but in the spirit of just getting married I am trying to start…this was my first experiment and my husband LOVED it! Very easy recipe to follow for someone with no cooking experience. Going to pick something else to make w/ the pineapple cupcakes on Sunday. Thank you!! After making the mushroom soup I decided to make the mac & cheese with broccole and I had leftover cooked chicken so I added it. it was great and really a one meal dish. just made the recipe with an added 20 oz of ground turkey. (i cooked it seperately, then added back in with the cheese sauce into the broccoli/pasta). Tastes great! I also used 1/2 nonfat cheese and 1/2 reduced fat cheese. Mistake. The nonfat cheese really has no flavor 🙁 should've stuck with reduced fat…. I just made this tonight and I am in love! I couldn't believe an entire cup is only 315 calories. I was stuffed after I finished one serving. I cooked mine in a large casserole dish, and then sectioned them into 8 pieces. I measured one piece to make sure it was indeed 1 cup, and then put all the pieces in plastic bowls with plastic wrap over top. I'm so excited to eat this for dinner for the next few days. Portioning it out in easy-to-heat bowls makes it easy. Thanks for much for this amazing recipe! Yummy! My 21 year old son stopped by while it was baking. He wanted to taste it and then ended up taking all the leftovers home with him. We all loved it. I did use 1% milk though. Hi gina! Another great recipe 🙂 was just wondering – does this freeze well? I want to make this next week but I was wondering how large is each portion? Would you say it is filling enough for a meal by itself? Brittany – I just made this tonight and I would definitely say it's filling for one meal! Each serving is 1 cup, which doesn't seem like much on paper, but when you measure it out it looks like a good amount. After I finished it I was stuffed! My kids are not big eaters. Age 5 and 8, they eat a few bites of most things and are done. If it's green, I'm lucky if there is 1 bite taken. I made this tonight and my 8 year old asked for 3 helpings, and ate every bit of broccoli. Gina, you are a genius and have changed the way my family eats. We are so grateful to you. OOooh We just made this but added a couple avacados and some halved cherry tomatoes! SOOO good!!! So good! I've been looking at this recipe for a little while now and finally decided to make it, and OH MY GOD it was so, so good. I recently started dieting again, and to see this low calorie comfort food Macaroni and Cheese that I could also hide a vegetable in? Definitely a recipe I will do again! I've had this on my list for a while, and finally actually made it! It was so delicious! I made it gluten free, which was shockingly easy. I used corn pasta, quinoa flour, and GF bread crumbs, all in the listed amounts without any problem. The sauce took a bit longer to thicken up, but it did thicken perfectly in the end. I hadn't used corn pasta before, and I don't think I will again. I didn't particularly like the flavour. I love this recipe! So quick, so easy, so yummy! Try Tinkyada brand pastas, they're gluten free and awesome. You can find it at Whole Foods or even Kroger. Just had to post to let you know I made this for the first time several months ago and since then, it's become a regular in our rotation. In fact, we're having it tonight! Thank you Gina!! Totally amazing recipe. Even my son (who is autistic) who will not eat vegetables, ate it and more. I am also making it a second time this week as my kids have asked for it again. Thanks so much and a brilliant WW meal!!! This was so good! My kids ate more of it than they do regular fat mac & cheese (lots of butter and cheese). I've made it twice now…think it will be a weekly meal, thanks! 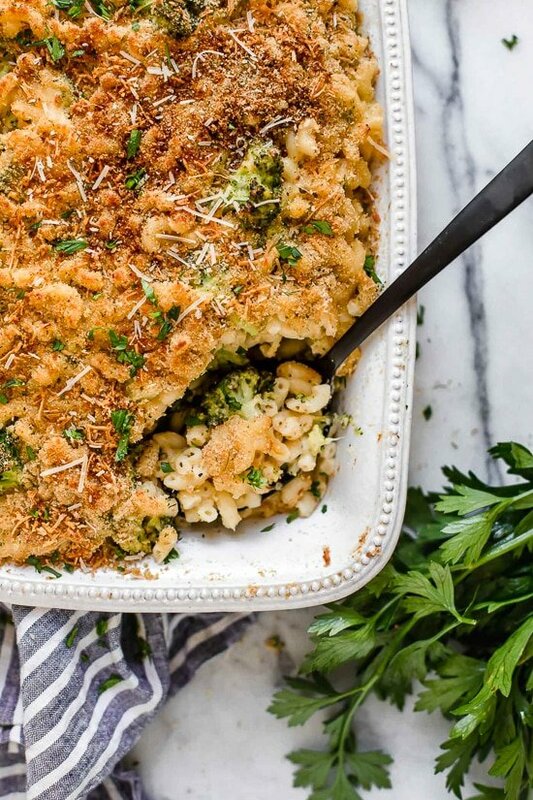 I love mac and cheese and broccoli, but this seems like a recipe for radically overcooked broccoli. 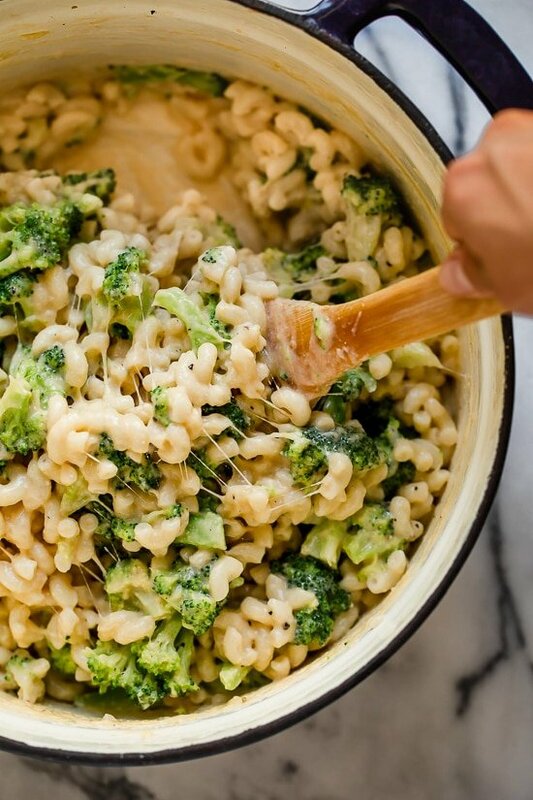 I'd rather bake the mac and cheese and serve the broccoli lightly steamed or blanched on the side, possibly stirred into the mac and cheese. Wow this looks delicious!! Another great alternative to using breadcrumbs is smashed almonds (or any other nut for that matter). You can hardly tell that it's not bread! OMG! This was so amazing. I just made it for lunch and my family really enjoyed it. The only difference with mine was that I added 1 cup of chopped mushrooms. Delish! I added mushrooms to, it was really good! I just made this last night and my boyfriend flipped! An instant hit and on our list of meals to make regularly now. this is delicious! i made this last week and it definitely is a new family favorite! thank you for the wonderful recipe! I made this last night with the mexican cheese blend and loved it! I also added some cajun seasoning to spice it up since I didn't make it salty enough. SO GOOD! And only 8 pts+ per serving? Amazing. I just plopped it on top of a bed of spinach so that I wouldn't over eat. DELICIOUS! We all loved this one! I used a frozen broccoli and carrot blend and whole grain shells as that's what I had in the pantry. Will definitely be making this again! delicious!!!! made it tonight and it was great! I made this the other day and it was SOOO good ! It's so easy to make and very hearty/ satisfying. I used 100% whole grain elbow pasta and whole wheat flour, which I imagine this makes it a bit healthier. Thanks for the wonderful recipe ! This was just okay. Made it as posted minus the onions, not a fan of onion crunch. It was fairly bland and not very cheesy. I think next time I will add some garlic and dry mustard. Though it was nice to try something different. I used garlic salt instead of table salt and added a pinch of red pepper. We all thought it was delicious! How far in advance can I make this? Will it hold up If I make it on a Friday but not serve it until Sunday? Just made this, DELICIOUS. Came out perfectly. So creamy and cheesy, you would never guess it was WW friendly! wow we just made this and it was delicious!! thanks! 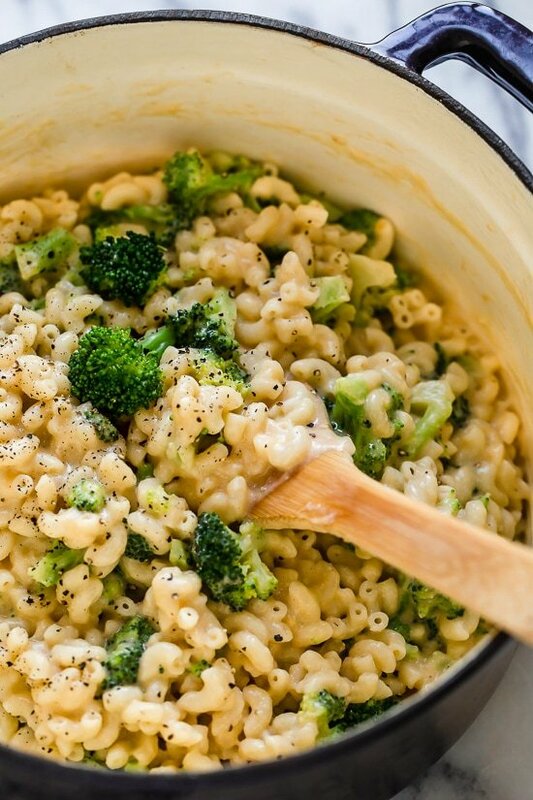 I have tried both this and your other mac & cheese recipes and they are delicious! Just wondering if you could add a skinny recipe for seafood or buffalo chicken mac & cheese. I think they would be great additions! This is one of the BEST mac n cheese recipes i have ever tried!! Definitely going to be a staple in our house!! Made this for the second time today, raves from the six year old, he had seconds, and I'm looking forward to leftovers for lunch tomorrow! This is pretty much identical to the Weight Watchers "Baked Macaroni and Cheese with Broccoli." I can't wait to make this recipe! It will be on my table tomorrow evening. And I guaranty my husband won't realize just how healthy it is. Bonus! I love love love your site. Just made this tonight. I only made 1/2 the recipe bc hubby is on 2nd shift and its just me and the 7 yr old daughter (who liked it) I did add a little leftover rotisserie chicken (skin removed of course) It was Soooo good. Thanks for the awesome dinner idea. Made this dish tonite and it was delicious, Hubby doesn't like brocolli so I just put it in half of the dish, he actually had two servings. Pretty good for WW and very filling. Doesn't taste like WW so hope I lose this week. Just tried this last night and my whole family (even my VERY picky 7 year old) loved it! In place of broth, I reserved a cup of the starch water from the macaroni and broccoli before I drained the pot. Its a trick many of us Italians use to thicken sauces! Hi Gina, is it 8 oz or 2 cups of shredded cheese? I love Mac and cheese and would love to make this. I have frozen broccoli, not fresh. Any suggestions? I made this the other night and added about 10 oz. shredded rotisserie chicken….YUM! Didn't add to many points and made it a full meal. So good! I have yet to make a recipe from this site that is bad! Just made this and added 95% fat free chopped ham. OMG!! Delish! First bite and kiddo said it was really good. Love your site. Everything I've made is awesome. So many more recipes I want to make. 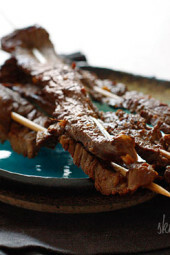 Even if not on a diet, these recipes are fantastic and healthy. I actually enjoy cooking lowfat again. Thank you! I made this for lunch today and it will be my lunch for the rest of the week – I added 4 servings of ham to it, so half a serving per 1 cup. It was so good.